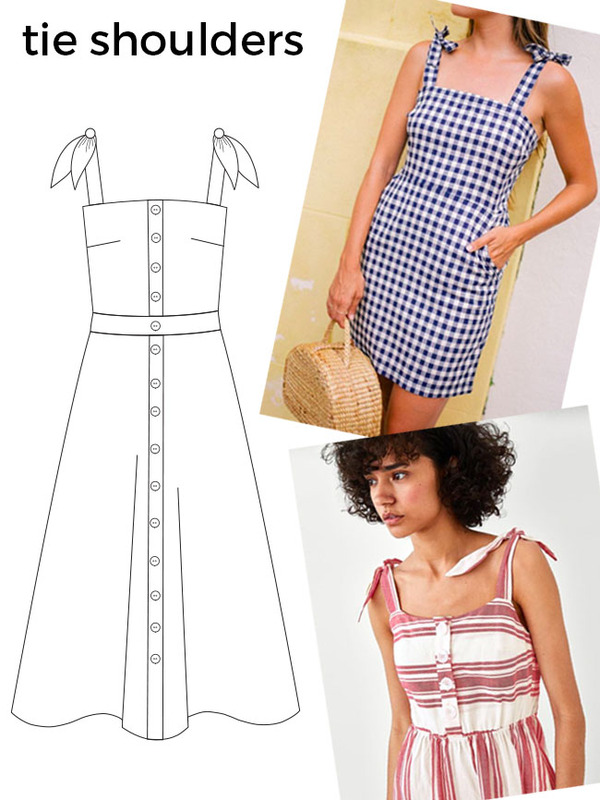 The Seren dress may be to-die-for as she is, but there is plenty of hack potential for creating extra little details and different looks with this pattern. As there are soooo many things you can do with this beauty and we thought we’d share a few ideas – we haven’t tried them out ourselves (yet!) so we’ve given a guide below on how you could approach the hack, but we would advise toiling before cutting into your treasured fabric. This super easy tweak adds a cute detail to your make and means those straps are forever adjustable! To get this effect, make four strap pieces instead of two. The length will depend on how much tie you want to play with - if you want to tie a bow you’d need more than if it’s going to be knotted. If you’re unsure test it out on a scrap piece of fabric first. If you want a squared off tie strap keep the shape as is, or if you want a curved tip you can re-draw your line before cutting out. You can also play with the thickness of the strap - check out our trick for turning narrow loops if you need some help with skinny straps. Stitch up one of the short ends of each strap and catch the other short end between the bodice and facing. For the sewist who loves having places to stash their phone, sweets and plenty more (that’s all of us right? ), why not add patch pockets to your Seren? 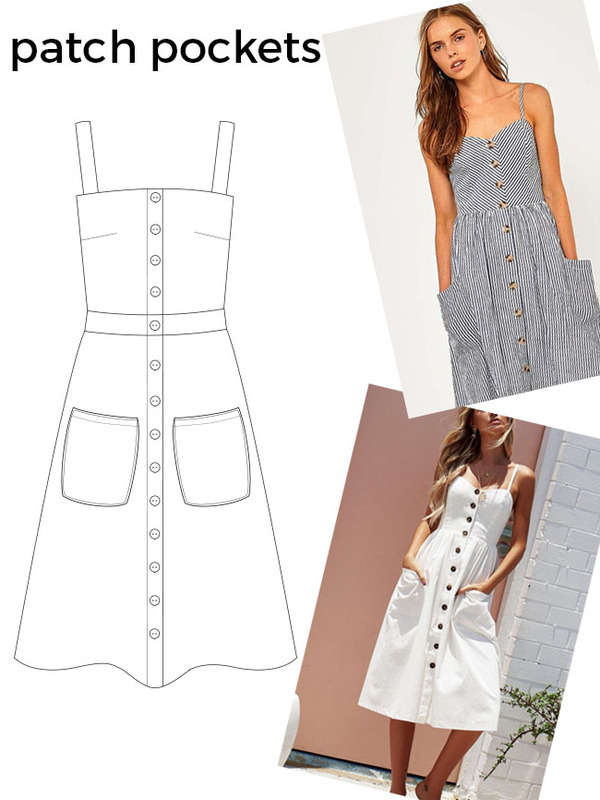 You can draft a pattern piece into which ever shape you fancy (if you have the Dominique skirt these pockets would work well) and stitch them onto the skirt front, or if you prefer a hidden pocket, follow our tutorial for adding in-seam pockets. 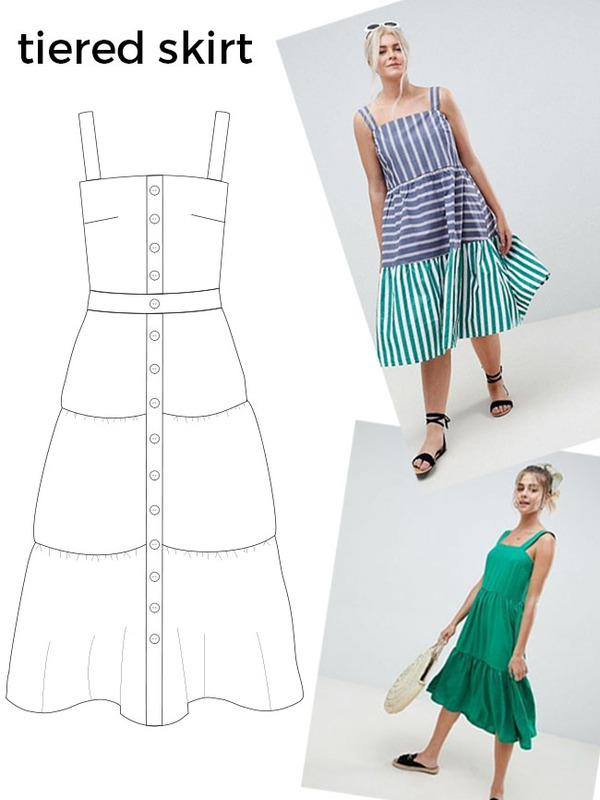 We love the idea of making a striped Seren that uses the pattern to create interest by playing around with its direction (especially when paired with patch pockets!). 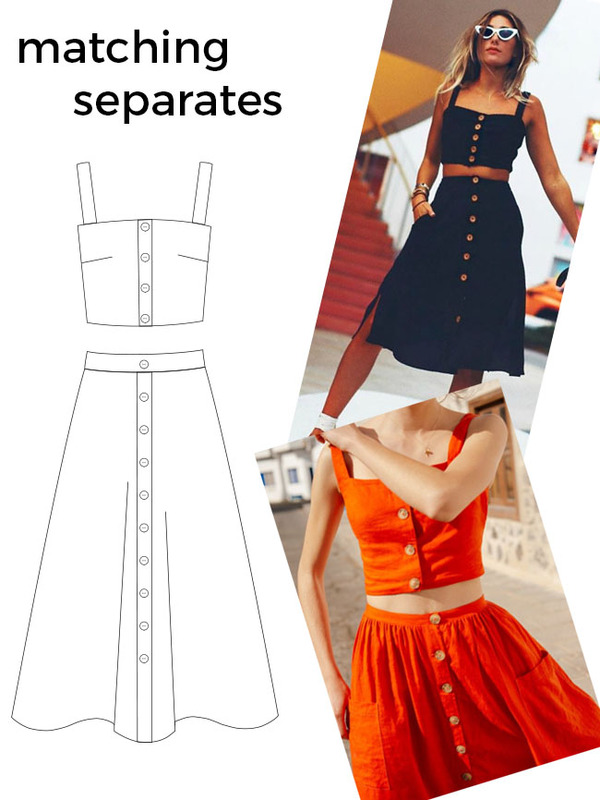 Look out for horizontal stripe fabric - cut your bodice and waistband (and patch pockets if you’re doing them) on the lengthwise grain and cut the skirt with the grainline at a 90 degree angle to the selvedges. 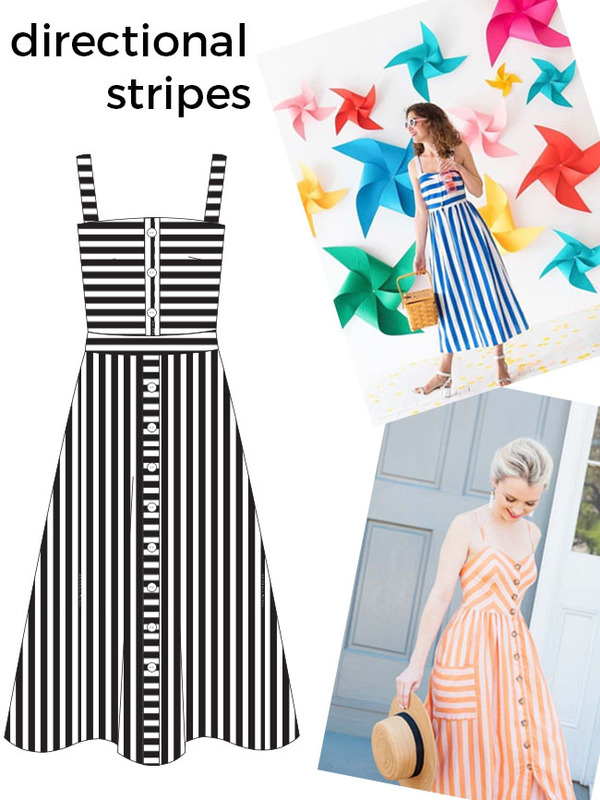 Such a pretty effect, and minimal stripe matching – winning! Ruffle and flounce details are so on trend at the moment and we think adding a ruffle to the straps would make a cute addition to Seren. To do this, you would need to create two rectangles of fabric longer than your straps (x1.5 is quite a nice ratio but alter this depending on how much ruffle you want). Finish one long side of each rectangle with a narrow hem. Gather the other long side and sandwich it between the long edges of the straps. If you like adding details to your makes, why not try out turning the flared skirt into a tiered one? Again, so on trend at the mo'! For this Franken-pattern you need to decide how many tiers you want – one, two, or even three – and create that many rectangles with each one wider than the one above. 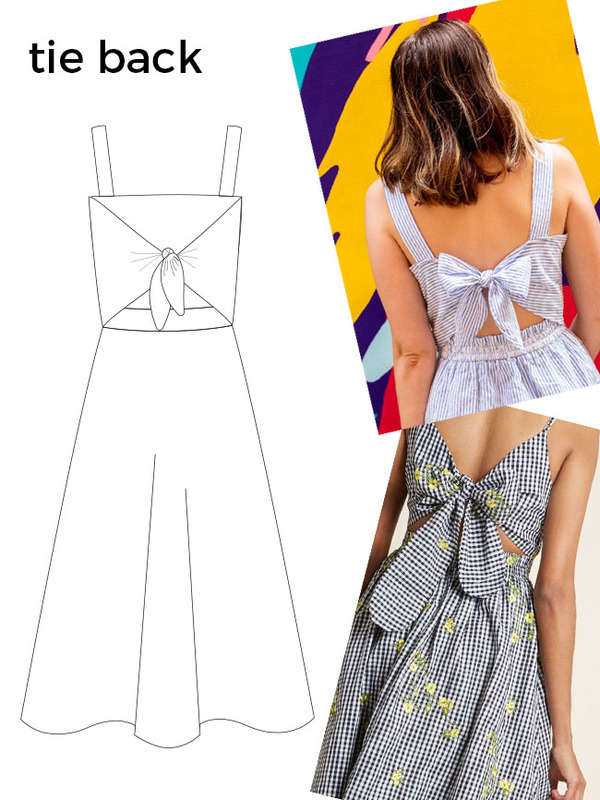 Gather the top edge of each tier into the seam above - check out our Agnes dress hack for a guide on creating a gathered skirt. Can’t choose just one shade for your gorgeous Seren? 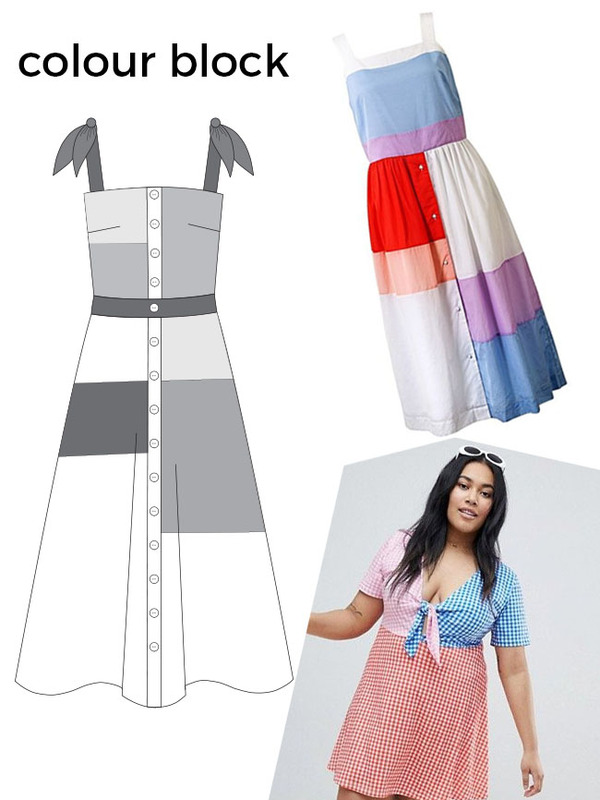 Why not give colour blocking a go? To create a patchwork effect, you’d need to create your coloured panels before stitching everything together and allow seam allowance onto each patchwork piece. 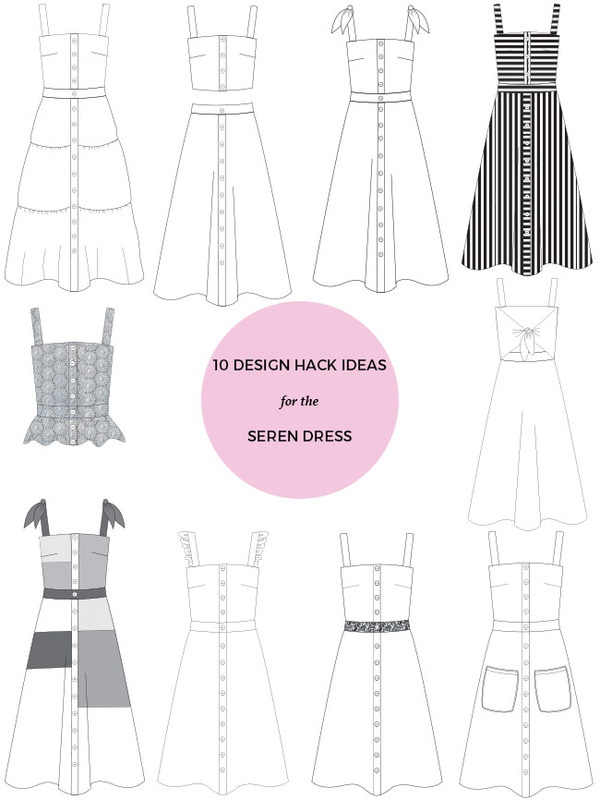 If you want something sweet to wear with high-waisted skirts, shorts and trousers, why not turn Seren into a top? This is really simple to do, just follow the instructions for the bodice and then finish the hem. We spotted our lovely friend and Stretch! model, Emily of Self Assembly Required, has turned her Seren into a peplum top – you should definitely check out her hack! We love an excuse for a trim and are swooning over the idea of lace being used in place of the waistband. It’s a simple but effective trick and would be a perfect addition to any Seren made for a special occasion. How dreamy would a tie back be on a crisp cotton Seren? Redraw the back bodice into a triangle shape with extensions for the ties. We'd love to see your Seren hacks! Please share with us on Insta @TillyButtons #SewingSeren.